Different to the usual bridal gowns, yet reasonable in price. Having been a ladies' tailor for several years I have learnt to listen carefully to what the client wants and also to help them choose the respective fabric as I can accompany them to advise them on what would be most suitable for what they had in mind. I deliver on time well within deadlines and I give an excellent and reliable service, complete in every way by even going to the bride's house on the big day to help dress her to ensure she goes out looking her best. I believe in giving a personal and professional made-to-measure service from beginning to end and pay great attention to detail. I only accept one wedding at a time to ensure the level of quality is kept up and so that I can concentrate on that one wedding which might include bridesmaids' dresses, mother of bride, mother of groom, maid of honour etc apart from the actual bride herself. I am also a great believer in altering and remodelling perfectly suitable dresses by giving them a completely different look but at the same time saving the bride a lot of expense by avoiding the necessity of buying new fabric. I do not consider any job too small as I keep in mind the customer's needs and that ultimately it is THEIR wedding day and as long as they are happy then so am I. 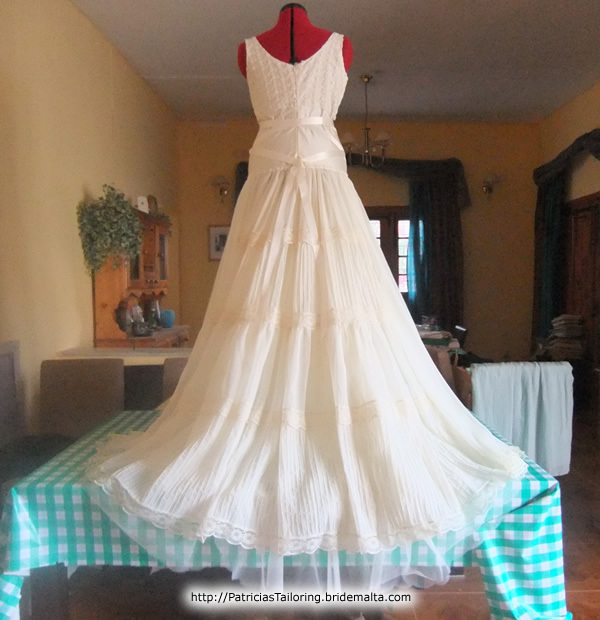 We started with part of the bride's mother's dress (the skirt) that we had left from the original dress to work on. The final dress is a mixture of georgette, chiffon, all-over lace, raw silk, tulle and satin lining and the finishes include satin ribbons, narrow lace and lace motifs that were cut out and hand sewn on to the dress. The idea for the dress was taken from three or four different ideas that the bride liked in other dresses and which we put together to produce the 'vintage style' dress that she was after. Even then, during the making of the actual dress, we kept amending it and rearranging it until the bride was finally satisfied with the end product. The dress features sections of pintucked and plain panels in the skirt, with lace trimming at the seams, as well as chiffon panels at the side to give the skirt more width and a small train. The fitted, raw silk bodice is partly covered in all-over lace at the top only, and features a front sweetheart neckline and a 'v'-shaped back neckline and is sleeveless. The skirt is gathered and quite full and has a petticoat attached underneath with layers of gathered tulle to make it stand out. To add interest to the back of the dress, a satin ribbon was attached from the front to the back and kept in place with a 'vintage' style brooche. The dress is fully lined underneath to give it 'body' and has lace and ribbon trimming also inside. 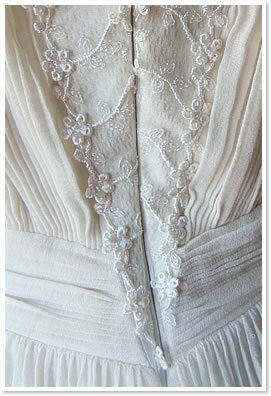 The jacket was an afterthought as we were not sure whether the cut of the bodice would be acceptable for church and it features button loops and pearl buttons down the front as well as lace trimming which had been cut from the original all over lace and used as a braid trim both on the bodice and on the collar and sleeves of the bodice. It is a fitted jacket stopping just beneath the bust with the pearl button and button loop closure at the front, with fitted sleeves coming to a point just above the centre finger and trimmed in lace. 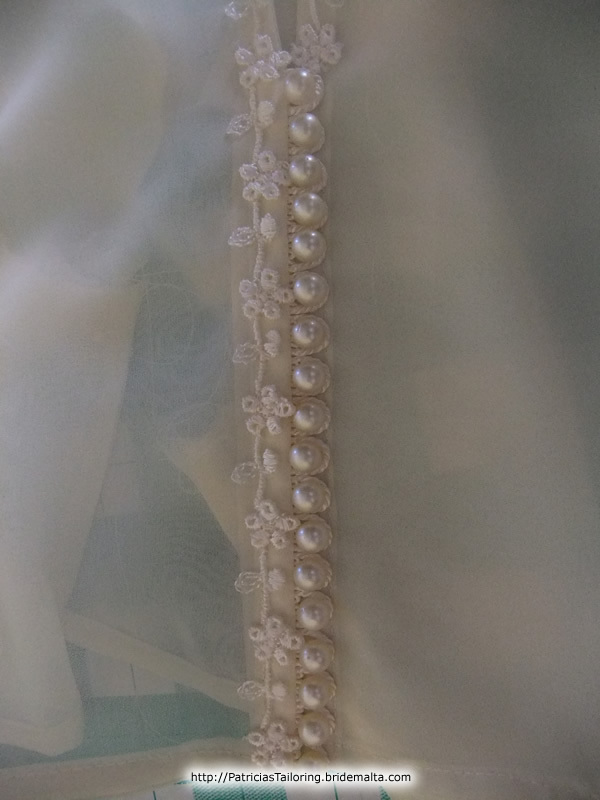 The veil originally also belonged to the mother and it was cut and sewn to a hair comb for the first ceremony and then for the final ceremony it was arranged to fit and sewn to a pearl tiara which the bride bought to finish off the original 'vintage' look. 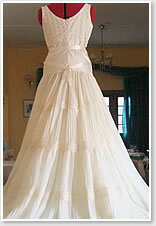 The style of the dress would suit any bride with a size 6 - 14 figure. "I have no hesitation in recommending Pat. She made me such a beautiful dress for my wedding. Her attention to detail, thorough and precise work really made the dress spectacular. Working with my mother's wedding dress and a few pictures of dresses I liked, Pat designed and created a lovely dress that had a vintage look and style and beautiful intricate lace work. Her tailoring credentials, professionalism and her love of dress making, combined with her ability to listen and realise what her clients want (and what will suit them), make her an exceptional seamstress. I highly recommend her and really hope she will have time to work on more dresses for me in the future." 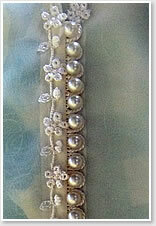 "Pat created a lovely fitted short jacket for me to wear to my daughter's wedding. She was careful to listen to what I wanted, as I don't like too short a bolero and I wanted the sleeves three quarter length. She took great care to get it exactly how I wanted it. I will definitely be asking her to make me more outfits in the future." "Patricia adopted the new name as "my fairy god mother" at the time of my wedding. I had to get a Caroline Castigliano gown taken in, shortened and lots of nips and tucks were needed to achieve the perfect fit for my big day. A job not for the faint hearted. Patricia did a fantastic job, keeping the sleek, demure elements to my dress. It fitted like a glove! Although, my biggest bridezilla moment came when my bridesmaids' dresses arrived from the mail order company, both in the wrong sizes. Patricia, somehow, managed to extract areas from within both dresses, helping her create the perfect fit once again. The job was technically very difficult, especially as both dresses were made by another seamstresses techniques. She also finished the trimmings on my mother's outfit, which really helped enhance the overall design. I was so happy to have discovered Patricia for the job as I really would have been lost without her and because our wedding was organized away in the UK, we had many other obstacles to face with the set up and organization for our big day. Patricia definitely took away a lot of my stresses and worries. 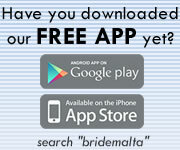 I would highly recommend her for her professional eye and expertise when it comes to wedding gowns. Added with her caring and sympathetic character she gives support and ease to the drama. Thank you Patricia! (My Maltese fairy god mother )"
"Pat has taken a few of my dresses and altered them to fit me better and she gets it right every time. She is currently mending a dress that I got in a sale that was badly made and quite damaged. She can fix anything!" This page has been visited 10862 times.